Minced beef in an onion gravy topped with mashed potato. 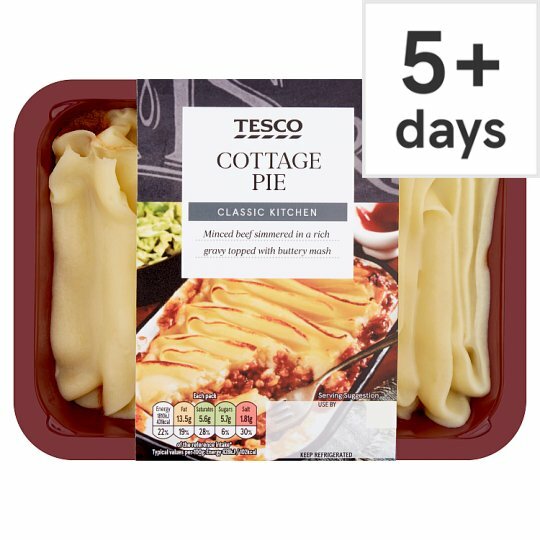 Mashed Potato (50%), Beef (28%), Onion, Water, Cornflour, Beef Fat, Rapeseed Oil, Wheat Flour (Wheat Flour, Calcium Carbonate, Iron, Niacin, Thiamin), Tomato Purée, Beef Extract, Garlic Purée, Caramelised Sugar, Salt, Sugar, Tomato Paste, Onion Concentrate, Thyme, White Pepper, Bay Leaf. Mashed Potato contains: Potato, Whole Milk, Butter (Milk), Salt, White Pepper. Instructions: From chilled: 190°C/Fan 170°C/Gas 5 25-30 mins For best results oven heat. Place onto a baking tray in the centre of a pre-heated oven. Leave to stand for 1 minute after heating. Instructions: From frozen: 190°C/Fan 170°C/Gas 5 45-50 mins For best results oven heat. Place onto a baking tray in the centre of a pre-heated oven. Leave to stand for 1 minute after heating. Heat on full power for 4 minutes (800W)/(900W). This tray may soften slightly but will regain strength on standing.